The benefits of juicing begin the moment you drink live juices that flood the cells with life giving nutrients. One of the most important ingredients from live plants is the active enzymes that your body uses to transform nutrients into a usable form for cellular health and growth. If I had to select one part of a plant based diet that would be the most important, it would be juicing! All of the enzymes are lost when you cook any live food. The body then has to manufacture its own enzymes to do the work. By consuming live food, the body does not have to work overtime to produce enzymes that are needed to transform cooked "dead" food into usable nutrients for cellular regeneration. All commercial bottled juice has been pasteurized and is without active enzymes. 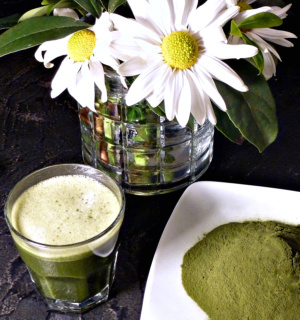 This green powder is great for long term health. The only way to get the benefits of juicing for health is with fresh vegetables. I would also include a green juice powder that has been cold processed so it retains the active enzymes when reconstituted with water or juice. Vegetable juicing with fresh, live vegetables is loaded with minerals, vitamins, phytonutrients, protein, carbohydrates, and oils. These are just a few of the wonderful benefits of juicing. Thousands of new chemicals that are beneficial to life have yet to be identified in the symphony of ingredients found in whole live plants. When we drink fresh juice, millions of interacting chemical reactions are provided by the plant's nutrients that perform their life sustaining act. This in turn provides our bodies with what is needed for our healthy cell growth. Juicing for health IS juicing for life! In 1999 when I was diagnosed with prostate cancer, I decided that surgery, radiation and chemotherapy were not an option for me, so I went looking for a natural cure instead. After studying about the healing power of food, I decided that this was the way to go, and juicing played an important part in my recovery from cancer. I still include vegetable juicing in my recovery diet, and juice carrots five days a week. I also add celery and Granny Smith apples, and occasionally I add fresh beets or some green leafy vegetables. Barbara and I consider all the benefits of juicing to be a major part of maintaining our great health. Juicing for health - ideas from my personal experience. Use organic products when you can afford it, since they are not exposed to pesticides and genetically modified produce (GMO). Organic California carrots are sweeter than most other carrots and also have more mineral content. If you don't use organic produce, make sure that you wash the product thoroughly to eliminate most of the applied chemicals. Good news...Dr. Colin Campbell, PhD, author of "The China Study" discovered in his studies that a plant based diet trumps cancer causing chemicals present in conventional farm raised products. Buy locally when possible to support local farmers that have fresher products and are usually less expensive. However, if you decide that the benefits of juicing for the long term are for you, I encourage you to buy a juicer that will be good at juicing wheat grass and leafy greens as well as solid vegetables...AND has a good warranty. 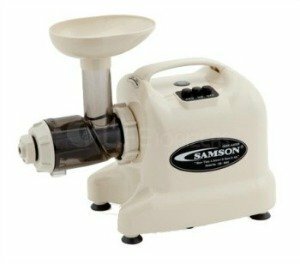 Our favorite juicer is affordable, easy to use and clean, 15 year warranty and has free shipping! A good way to store the juice is by using 8 ounce Mason jars for each individual serving. Fill the jars to the brim and cap so that you can minimize oxidation. This makes it convenient to grab one out of the refrigerator when wanted. Storing all of the juice in a pitcher causes rapid oxidation as you draw down the juice. It's good to limit the amount that you drink at one time to 8 - 10 ounces. To increase the benefits of juicing, keep all the vegetables cold before you start juicing. You will have a better quality juice...and in some cases more juice. You lose about 10% of the nutrients in the juice per day. If you freeze it, you lose about 1% per month. One of our past students does his vegetable juicing for the week all at one time. He freezes a week's worth of juice at a time and thaws the individual servings as needed by placing the juice in the refrigerator to thaw the day before it is needed. You will have a lot of Mason jars in the freezer! Make sure you leave room in the glass container to allow for expansion if you use this method. Our Juicing Recipes for Ultimate Health are one of the most powerful healing prescriptions available anywhere. Don't confuse blenders with juicers. Blenders process the fiber and the nutrients together. Juicers separate the fiber from the nutrients. This is extremely important when juicing for health. When you ingest the fiber with the nutrients, the digestive process begins. You may get 10% - 30% of the nutrients extracted when the bulk passes through the intestines and colon during digestion. When you drink the juice without fiber before any digestion begins, you may get 90% plus of the nutrients absorbed through the intestinal wall. This is one of the important benefits to juicing for health. Please note...fiber is super important, it's just not good to mix juicing and fiber when you are trying to get the most out of available plant nutrients. The fiber of whole foods limits the amount you can comfortably place in your stomach. If you tried to eat 4 pounds of carrots a day you would have real digestive problems. However, the juice from 4 pounds of carrots is about 32 ounces of juice and your system can usually handle that amount without any problem. The juice of whole foods can be consumed in large quantities and will not over burden the digestive system, and will flood your body with abundant nutrients. Increase the benefits of juicing when you drink your juice 30 minutes before a meal or 2 hours after a meal. This way the "powerful" juice doesn't get involved in the digestive process. But, whatever you do, get the juice in you somehow. You'll be glad you did! 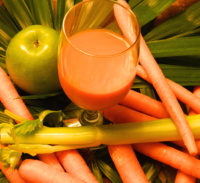 Juicing Recipes - Our basic recipe we use everyday is planned with organic carrots. Combined with celery and apples, you now have one of the most powerful healing prescriptions available anywhere.